“CHAI ANOTHER DAY is my kind of mystery. A spicy cast of characters, an engaging plot, and a dash of romance make the latest Spice Shop Mystery by Leslie Budewitz a tasty read you’ll devour.” — Denise Swanson, New York Times-bestselling author of the Scumble River and Chef-to-Go mystery series. “Leslie Budewitz’s Spice Shop mysteries just keep getting better and better. 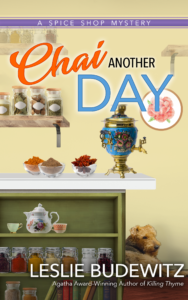 Her latest, CHAI ANOTHER DAY, has everything I love in a cozy mystery: a smart, gutsy protagonist determined to find the answers; a savory setting steeped in history; an abundance of mouth-watering food, drink, and spices; a truly delightful doggy; and best of all, an expertly seasoned murder plot that had me guessing–and grinning–to the very end.” —Kate Carlisle, New York Times-bestselling author of the Fixer-Upper Mysteries and the Bibliophile Mysteries. Only a certified nut case would take a yoga class at noon then head for a massage on a day hotter than a freshly pulled shot of espresso. That goes double in Seattle, where only the newest and grooviest of buildings boast A/C. Used to be, a hot August day meant seventy-five degrees, maybe eighty, with visitors smiling and natives melting. Walking down Eastlake Avenue, I should have felt a cool breeze rolling up from Lake Union, a few blocks away. But no. The day was so still the only waft of air I caught was tinged with exhaust from the delivery van idling on the side street. Welcome to the new Seattle, where climate is the only thing changing faster than the city’s skyline. Between running my spice shop in the Pike Place Market during the height of tourist season and keeping up with my mother, who’d returned to the city for the summer, life was full. Throw a new relationship into the mix and I was happier than the clams at the fish counter in the Market. Though they were on ice, which at the moment, gave them the advantage. Happy, but tired. I’d probably fall asleep on Seetha’s massage table. The light changed and I stepped into the street. On Eastlake, a bus pulled into the stop with an electric swish, and passengers streamed off. A white guy in olive cargo pants sprinted up the hill and jumped on board moments before the bus drove off. I passed the corner café, a restaurant called Speziato—Italian for spicy, and a handful of other shops and businesses. Halfway down the block stood my destination, a two-story red brick building with the year 1928 carved into a sandstone block beside the front door. The building sat back from the sidewalk about ten feet, creating a delightful space—half alcove, half courtyard—bounded by the neighboring structures on the north and south, and a low stone wall street-side. Rainy Day Vintage, one of my favorite places, occupied the first floor. Seetha lived and worked her massage magic upstairs. I felt a fairy godmother’s pride, having suggested the vacant retail space when Aimee McGillvray said she was on the hunt. We’d met when she worked in a sprawling treasure trove of international antiques and imports, where I’d found some of the furniture for my loft. She’d become a Spice Shop customer and occasional yoga classmate, and opened this place last spring. A great fit, if I do say so myself. Aimee had converted the courtyard into a peaceful city retreat that invited lingering. Teak and iron chairs surrounded a mosaic-topped table, shaded by a striped beach umbrella. A colorful stack of ceramic planters filled the corner. Basil, parsley, and elegantly clownish nasturtiums in orange, red, and yellow thrived in window boxes. The neon sign in the window was off. Aimee’s neon collection is to die for. A dog welded from discarded car parts and tools stood guard, his ears the business ends of well-aged trowels. I gave him a quick pat on the sprinkler head and pushed open the outer door. Inside the tiny vestibule, the door on the left led to the shop while a locked door on the right led to the apartments above. I punched the intercom for the apartments and grabbed the knob. Voices snared my attention, and I cocked my head, listening. The buzzer sounded before I could find out what the speaker didn’t want to hear, and I jerked the door open. The reply was equally angry, but undecipherable. Aimee? I honestly couldn’t recognize the speaker, or tell if the other person was male or female. But it was none of my business, and my left shoulder ached for the ministrations of my waiting friend, so I closed the door behind me and trotted up the stairs.